May. 24, 2013 8:00 p.m. When the family gathered to assist with the opening of the new Millet Denture Clinic, all four generations of the family were present. 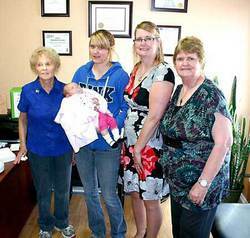 Left: Mother-in-law, Elsie Unger, Daughter Charleen Bernhard holding grandaughter Samantha Bernhard, Barb Unger, and Mom, Jeanne Steringa.